Falls Lake is a beautiful alpine lake in the Coquihalla Summit Recreation Area. 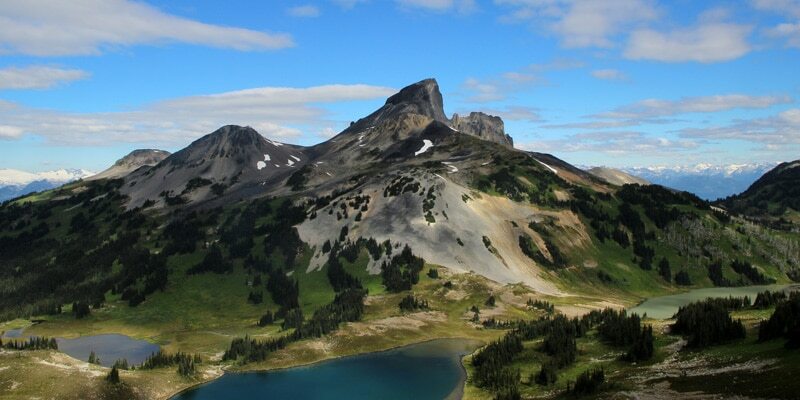 It is a short and easy hike from a pullout off the Coquihalla Highway, east of Hope and west of Merrit. A hike to Falls Lake is a great way to stretch your legs during a long drive along the Coquihalla Highway. It takes about 30 minutes to reach the lake from the parking area, with minimal elevation gain. There are a few first-come, first-served tent pads along the lake for those wanting to camp. During the hot summer months, Falls Lake is the perfect spot for a cold swim. It is also a kid-friendly hike. It is worth being extra-cautious with wildlife (bears and cougars ) on this hike. There have also been vehicle break-ins in the parking area – so don’t leave anything valuable in your car. Walking out from the gravel parking lot area (directions), you will go right, onto the wide path. The path takes you over a small creek where you will see a B.C. Parks sign. There is a junction here which is marked with trail directions. To the right takes you to Zoa Peak. To the left is marked for Falls Lake, at 900 m. Go left. There are a few stairs, and the trail starts climbing uphill gently. It is a wide trail that is well-maintained and clear of debris. After a few minutes, the trail has more exposed tree roots which will slow you down, but it remains easy to follow. There are orange markers in the trees to guide you along the trail. After 250 m, you will cross a wooden footbridge over a (potentially dry) creek. The forest is scenic and the trail is enjoyable. It’s only a matter of following the trail on the short hike until you reach the lake. After some zig-zagging and crossing over boardwalks, you will see the lake emerge ahead of you through the trees. The lake is gorgeous, surrounded by peaks on all sides. Thar Peak can be seen on your left, and Zoa Peak on your right. You can go for a swim here, eat lunch, and enjoy the scenery. You can also follow the trail around the right-hand side of the lake if you wish to walk further, finding a somewhat sandy area to enter the lake. After you’ve enjoyed the scenery, retrace your steps back to the parking area. There are two tent pads near the edge of the lake where the trail first reaches the shore. They are first-come-first-serve sites, and everything in the park is self-service (ie, Leave No Trace camping). There are no facilities provided, and fires are not permitted. From Vancouver head east on Trans Canada Highway/BC-1. From Hope, take the Coquihalla Highway (BC-5 N) to the Coquihalla Summit Recreation Area. Take Exit #221 which will be marked for Falls Lake. The road will take you under the highway, and then you will actually head back west a short ways. On your right, there is a road leading up into the forest. Turn right, and follow the road up to a large, gravel parking area. Falls Lake is the perfect place to take a quick break during a long drive along the Coquihalla Highway.